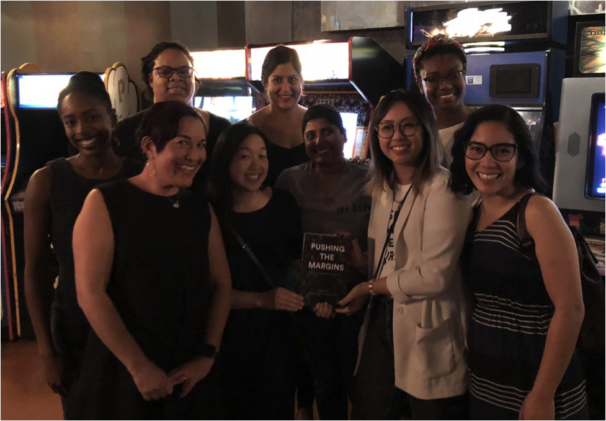 Congratulations to Rose L. Chou of American University and Annie Pho of UCLA for their newly published edited volume, Pushing the Margins: Women of Color and Intersectionality in LIS (Library Juice Press, 2018). This edited collection “explores the experiences of women of color in library and information science (LIS). With roots in black feminism, critical race theory, and intersectionality Pushing the Margins studies the ways in which multiple social and cultural identities impact individual experience. This book examines how lived experiences of social identities affect women of color and their work in LIS.” With over 17 chapters including the foreword by Fobazi Ettarh, these essays cover a variety of important topics ranging from the experiences of Muslim Women and Public Libraries by Negeen Aghassibake to “The Voice of a Black Woman in Libraryland: A Theoretical Narrative” by Laverne Gray. To celebrate the arrival of this new book, the editors organized a book release celebration Friday night in Sister Bar, near the Albuquerque Convention Center. #JCLC2018 attendees, chapter contributors, supporters, allies, and friends gathered together at the bar to share this special moment and recognition for everyone involved the project. Congratulations to the editors and authors for this timely and extraordinary edited collection!